After the coolest looking work boots for the money? Check out our pick, the Scruffs Switchback. Welcome to our 10-minute review of the best work boots (that are actually comfortable), currently available in the UK. Whether you’re a plumber, roofer or builder, this guide has EVERYTHING you need to know to make your next purchase. There are 10 recommendations below, so there’s a boot to suit every budget. The review covers a range of boots from the top brands, focusing on durability and comfort. Naturally, being suitable for construction and site work, we’re only focusing on hard wearing safety boots with steel toes caps. And, we’ve even offered up a recommendation for a set of boots specifically designed for women (#10 on this list). 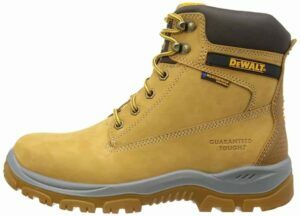 If you’re looking for a true all-rounder, the Dewalt Titanium safety boots (with steel toe caps) are a good place to start. The first thing you’ll notice, is there’s a big focus here on comfort. Unlike the cheap work boots on the market in the UK, the collar AND the tongue of the Dewalt Titaniums is padded. So, you won’t get rubbing, even if your standing up all day. Compared with other work boots, there’s a slightly wider fit. And, the fact that they’re both breathable and waterproof means you’ll be comfortable all day, even if you’re working in hot conditions, or on a muddy site. You’ll get plenty of durability too. There’s a high quality (and protective) 200J steel toe cap, and a shock absorbing sole that’s dual density (so it lasts). The mid-sole is steel penetration resistant (basically, no nails through your foot), you’ll get a rigid TPU heel guard, and plenty of ankle support. There’s a big problem with most of the best work boots on the market today; they look ugly, and they feel bulky. So, if you’re looking for a set of work boots with steel toe caps that look cool and are lightweight, look no further than the Scruffs Switchback. In fact, they’re so lightweight and slimline, there’s a good chance they’re going to get mistaken for trainers. But built into the toe, you’ll get a steel toe cap that’s S3 rated. And for further protection, you’ll get a durable midsole that’s reinforced to protect your foot. The cushioned leather uppers and sports style inner sole means these are one of the most comfortable work boots on offer in the UK right now. And, unlike other durable safety boots, you won’t need to break these in. Just like a pair of trainers, you’ll get no-rub, straight out of the box. For durability, you’ll get a heat resistant sole. The moulded protector keeps the boot intact, but it’s also extremely comfortable; no rubbing here, means no blisters. And, there’s a tonne of online reviews from happy tradesmen that have purchased the Scruffs Switchback. OK, so what if your budget doesn’t stretch to the Scruffs Switchback, or the DeWalt Titanium? Then, you might want to look at the DeWalt Apprentice boots. 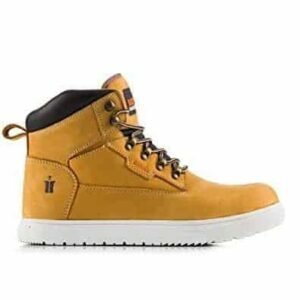 A quick search online shows that the DeWalt Apprentice steel toe cap boots are among the most popular in the UK; there’s a tonne of reviews online. Why? They’re ridiculously cheap in comparison to competitor’s products. 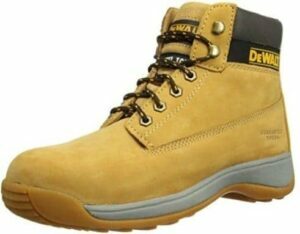 I’ve owned a few pairs of the DeWalt apprentice steel toe cap boots, and they do offer excellent value for money. Even if you’re working/standing up all day, you won’t sweat in these boots. And, even if you do, there’s an anti-bacterial sole. That combined with the breathability on offer means that these boots are fresh, even at the end of the week. More importantly, there’s plenty of protection on offer. You’ll get a sole that isn’t just dual density, it’s shock absorbent too. The sole is made from EVA rubber, tested to 300 degrees and has a SRA slip rating thanks to being oil resistant, so they’re safe for all types of site work, even roofing. Overall, this is one of the best work boots for the money. HOWEVER, if you’re focus for your new boots is comfort, you’ll want to put another £15-20 aside and upgrade to a set like the DeWalt Titanium. I found these took a week or so to break-in. If you’re a fan of the Scruffs Switchback, but want something with a little more protection, head straight for the Scruffs OXIDE. Like the Switchbacks, the OXIDE boots look cool, but they certainly deliver on all fronts including comfort, durability and protection. So, water resistant, doesn’t mean waterproof. If you stand in a puddle, your feet are going to get wet; it’s as simple as that. But, if you’re on a muddy site with light rain, there’s a good chance your feet are going to stay dry, and that means you’re comfortable when working. And on the note of comfort, you’ll get soft leather and Suede on the upper part of the boot, and the normal padded tongue and collar. Like most Scruffs work safety boots, you’ll get a sole with one purpose; to absorb shock. If you’ve got problems with your ankles or knees, that’s going to make an enormous difference. Durability wise, you’ll get a sole that’s pierce, slip and heat resistant, so these boots are going to last. After a cool looking set of water resistant boots? The Scruffs OXIDE are for you! If you’re looking for a set of dirt cheap work boots, look no further than the Dickies Hiker. On a good day, you’ll be able to get change from £20. Although these boots have some level of durability, comfort and protection, it’s a scratch on what’s on offer from other steel toe cap boots on this list. So, if you’re looking for comfort when both driving to a job and working on it, you might have to rub a few more notes together and head back to #1 and #2 on this list. You do get a steel toe cap, and a steel midsole with a prime purpose of protection underfoot. And to be fair, the sole has a level of shock absorption in it which is welcomed for those that suffer with knee pain, as well as being dual density for durability. All that combined with the price, means that Dickies sell a tonne of these safety boots. 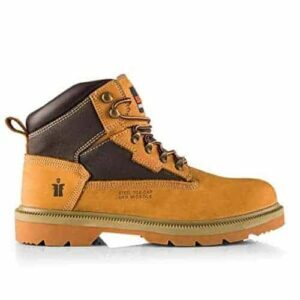 In fact, they’re one of the most popular work boots available online, with hundreds of positive reviews. If you’re looking for cheap work boots, the Dickies Hikers are the ones for you. But, expect to compromise when it comes to comfort and durability. 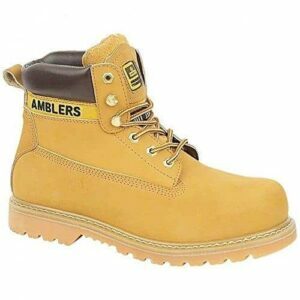 The Apache Safety Boots are a direct competitor to the DeWalt Apprentice. They’re similar in price, and the features are almost identical. 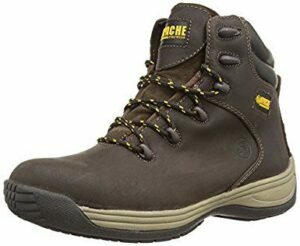 So, if you’ve got the budget for the DeWalt Apprentice boots, you’ll want to check out Apache too. You’ll notice they don’t have the volume of online reviews that the Apprentice boots have, but that’s more of a branding thing than anything else. DeWalt are just better known and stocked in a lot more stores. The materials used are water resistant, so you’ll stay dry and comfortable in anything but torrential rain. And, the padded collar and tongue, composite mid and shock absorbing sole all adds to that comfort. They come with a S3 safety rating and SRA slip rating, so they’re perfect for construction sites where the site foreman is strict on what can and can’t be worn. These ratings are thanks to the chemical resistant, oil resistant and tough EVA rubber sole. Like the Apprentice, the focus is a middle-ground of durability and comfort. So, if you’re looking for the most comfortable work boots available in the UK, you’d be better with #1 and #2 in our list. Ready to compromise a little, and save around £20 in the process? The Apache Safety boots are the ones for you. If you’re looking for durable work boots offering a tonne of ankle support, there are going to be very few that can offer what the CAT Holtons can. It’s a protective but comfortable boot, perfect for those needing ankle support, as well as those with wide or flat feet. The 100% leather upper on the Holton boots is flexible, but it does offer additional ankle support (being higher than most) in comparison to your average trade boots. Comfort is further amplified thanks to the Flex sole and padded tongue and collar. And, that means that if you have ankle problems or are standing up all day, you’re going to be much more comfortable in these boots, than any other. Safety wise, you get the usual steel toe cap with a 200J rating. The overall safety rating for the CAT Holton work boots is S1 P SRA. There is one let down with the CAT Holton boots, and that’s the midsole. Although it’s incredibly durable, it’s not as protective as #1 and #2 in our list. For average site work though, it’s more than enough. Durability wise, you’re not going to wear out these boots any time soon. It’s got a chemical resistant, oil repelling, anti-static and 300 degree heat resistant sole. Looking for the best work boots for ankle support? The CAT Holtons are the ones for you. If you’re prone to dropping stuff on site, or work on a construction where there’s just too many hazards, you need to be thinking beyond just being comfortable. Instead, you need to be looking at work boots that offer the maximum amount of protection possible. And, that’s where the Scruffs Twisters come into play. The core feature of the Scruffs Twister work boots, is the strength of the steel toe cap and mid-sole protection. Here, you’ll have resistance to piercing up to 1100kN, and that’s about as good as your going to get. But, that doesn’t mean that the Scruffs Twisters are uncomfortable. Far from it in fact. Thanks to the PU sole that merges into rubber, these are one of the lightest work boots available in the UK. And comfort is going to be heightened further thanks to the padded tongue and upper part of the boot. It’s utilises a flat heel, and that means they’re even comfortable for those that have flat or wide feet. For on-site safety, you’ll get a SRC slip resistant sole. And, for durability, you’ve got a hard wearing sole and reinforced lace eyelets. Want to keep your feet intact on site? Head straight for the Scruffs Twisters. Looking for a set of work boots that look like trainers, and want flat-out comfort? Where you need to be putting your money, is in Scruffs pocket. They’ve come up with a range of “trainer looking” work safety boots that incorporate steel toe caps, and the Twister Sport trainers are one of them. You’ll get a strong steel toe cap for protection, but you also get protection for your feet in the form of a composite midsole. That’s covered by a strong, durable but flexible rubber sole, so they’re not going to wear out any time soon. 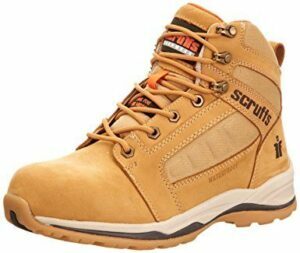 Price wise, they compare to the likes of the DeWalt Apprentice and the Apache Safety, so they’re a lot cheaper than many of the other top work boots out there. 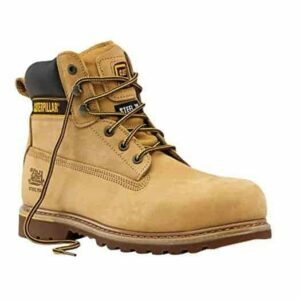 The Scruffs Twister Sport are a great alternative for tradesmen that just can’t get the comfort level from traditional safety boots, and they look awesome! Here’s the thing. There’s not a tonne of options when it comes to women’s work boots. So, here’s a specifically designed women’s work boot, for those on a tight budget. If you’re looking for a good set of women’s work boots with ankle support, there’s a good chance you don’t have the budget to buy the CAT Holton. If that’s the case, your next best bet is going to be the Amblers FS7. The FS7 has a durable steel toe cap, and unlike the Holtons, there is extensive mid-sole support here. The lacing structure reduces pressure points on the ankle, but offers the support needed at the same time. Comfort wise, you’ll get a padded tongue and upper boot area, and the usual SRA slip rating, so you’re going to be safe. Looking for women’s work boots on a budget? Head straight for the Amblers FS7. We’ve already recommended a tonne of comfortable work boots here and explained which ones are the best for what. But, what if you’re not a fan of any boots on our top 10 list? The main thing, is to make sure you stick to reputable workwear brands. Over the last few years, we’ve seen a tonne of cheap (and honestly, low-quality) brands work their way onto popular ecommerce stores and local builder’s merchants. The problem? You really-do get what you pay for. If you want a combination of protection (quality steel toe caps), comfort (especially if you have flat or wide feet) AND durability (hard wearing soles), you’ve got to stick to the best work boot brands. Ready to jump straight into the list? Amblers aren’t your average workwear brand. Instead of focusing on producing a full range of workwear, their focus is on work safety boots only. Better still, they’ve been producing their safety boots in the UK since the 1980s. Although they’re not as well known as the likes of CAT or Scruffs, they’ve made our best work boot brands list thanks to the fact they’re a specialist UK boot manufacturer. And another bonus? They’re cheap as chips. 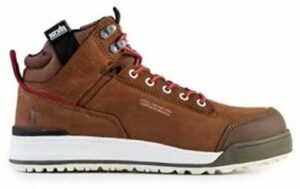 If you’re a fan of UK companies, then Apache is another work boot brand you should be looking into. They’ve been creating quality workwear for the construction industry since 1999. The manufacturing process for their work boots starts in the UK, and stroll into any leading builder’s merchants and you’ll see their workwear. I’ve owned plenty of Apache products, including their work trousers. I can hand on heart say that their stuff is cheap, but it rivals the very best in the business. If you’re looking for hardwearing work boots, CAT has got you covered. 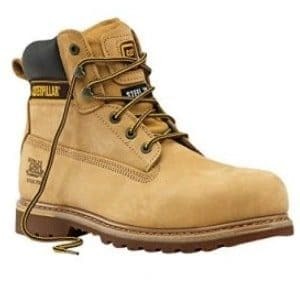 Typically, their boots tend to be suited to muddy site work (groundworkers etc) and those looking for extra ankle support (the CAT Holton boots for instance). Probably better known for their tools, but the workwear coming out of the DeWalt factory is some of the best. They’ve got work boots right at the low-end, and some into premium price brackets. And, even their cheap work boots (like the DeWalt Apprentice) are some of the most comfortable on offer in the UK. The Dickies brand is probably the oldest and most well-known workwear company on this list. They’ve been creating workwear (including safety trainers and work boots) since back in 1922. That said, compared with many other brands on this list, they tend to focus too much on being cheaper, rather than being comfortable. But, the compromise on comfort does have an upside; cost. 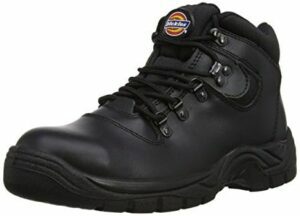 Dickies tend to offer work boots at the lower end of other workwear brands. Another UK based boot brand, is Dr Martens. We’re a huge fan of specialist companies. And, Dr Martens is exactly that. The company was formed back in 1901 in Northampton and have since added work safety boots to their product line up. Their boots tend to sit in the higher end in terms of budget, and the focus here is on design and comfort. If you’re looking for the cheapest work boots possible, these are probably not going to be the right brand for you. Scruffs is another of the newer brands that’s managed to make a reasonable dent in the UK workwear market; they were only setup back in 2003. Scruffs tend to offer products that sit in a nice middle ground. They combine quality, durability and comfort; but their kit doesn’t break the bank. There’s a tonne of quality work boots on offer such as the OXIDE and Twisters. You don’t build a workwear brand that’s been going for over 40 years and sold in 40 different countries, unless you sell good stuff. And, that’s what Snickers has managed to achieve; arguably one of the best work boot brands in the world. If you’re looking for stuff that fits well offering plenty of comfort, looks cool and is in the mid-high end in terms of price, Snickers is a good shout. Another company that specialises on producing top quality boots, for all walks of life. Timberland have been producing gear since 1952. Typically, the focus here is on comfort, but that’s going to come at a cost; they’re one of the most expensive work boot brands on this list. Work Boots, Or Rigger Boots? Not all site work is suited to the work boots on our list. Particularly if the work you do tends to be on muddy and wet construction sites. If you’re a groundworker working on muddy construction sites, there’s a good chance that rigger boots are going to be more suitable. And, we’ve already created an extensive guide to the best rigger boots on offer here. However, if you’re the likes of a plumber, electrician or roofer working on an average site, you’ll want to stick to the boots we’ve listed above. Thanks for reading our guide to the best work safety boots with steel toe caps, and for maximum comfort. Got a set of safety boots that are available in the UK that aren’t listed? We’d love to hear what you think about them, drop a comment below.